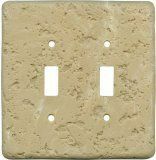 Our Simulated Stone Switch Plates are created by combining our special resin with real crushed stone to give you the look and feel of natural stone. These switchplates are made to match travertine and tumbled marble by retaining the texture that occurs naturally, but with more durability than natural stone. As these are all custom made to order, please allow up to 2 weeks for delivery.